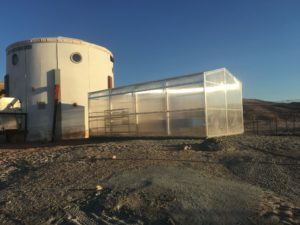 Work on the Mars Society's new GreenHab at the Mars Desert Research Station (MDRS) in Utah is almost finished! The new greenhouse is a wonderful addition to the MDRS facility and will serve crew members in their important research for years to come. of greenhouse use and will therefore be retrofitted into a state-of-the-art science lab, expanding the organization's ability to carry out Mars-related testing and analysis. The Mars Society would like to express its appreciation to everyone who contributed to the GreenHab project, both via direct donation and as part of our Indiegogo crowdfunding campaign. We look forward to keeping you up-to-date about the important analog work being carried out at MDRS in the future.